284. Ju1 9, 2005. New breeder. Waited more than 2 hours after the birth of the last pup. 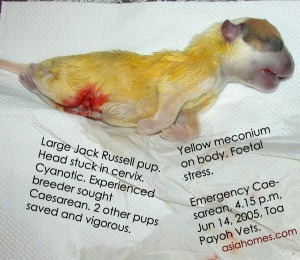 Dead 4th pup was small, had yellow meconium stained backside. It was stuck inside the uterine body. 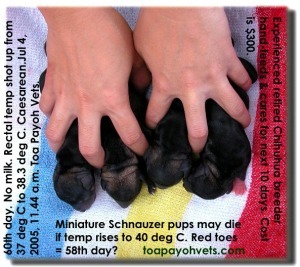 The 5th pup was large. Very deep inside uterine horn. Would have died if there was no midnight Caesarean delivery. 283. Ju1 5, 2005. 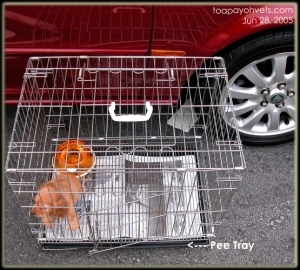 X-rays showed stomach full of food 4 4 pups. Rectal temp from 37 deg C shot to 38.3 in 5 hours. Home breeder. Dam has no milk. 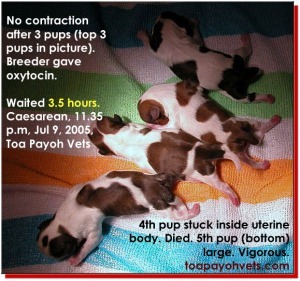 Vet asked an experienced breeder to look after pups. 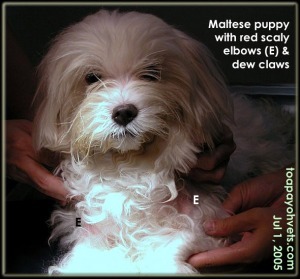 Red toes and thin coat = 58th day? Placentas "sticky" to 3 pups. Why? But 4 vigorous pups. 280. Jun 26, 2005. 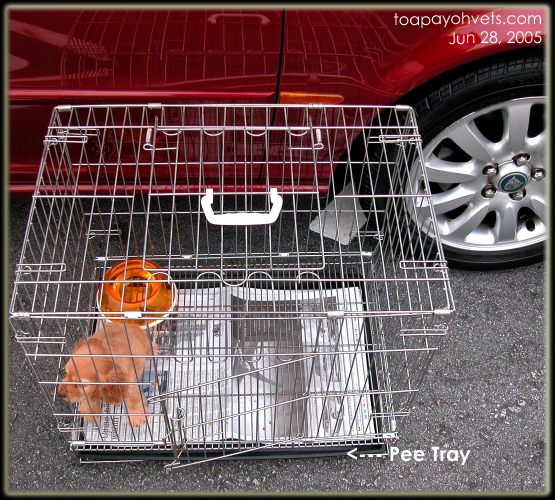 TOILET TRAINING CASE 2. 279. Jun 26, 2005. 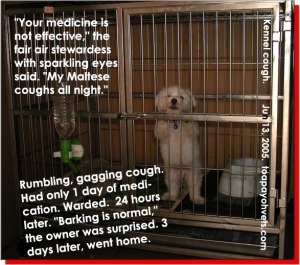 TOILET TRAINING CASE 1. Couple over 30 years old. Puppy respects male owner but not his wife when shown the cane. Was the Schnauzer spiteful? 278. Jun 24, 2005. TIPS FOR BREEDERS: lst vaccination at week 6. DO NOT sell pups to pet shops as they are not protected against parvoviruses. 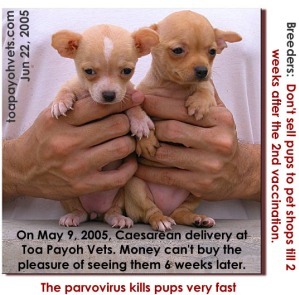 Some will die from parvoviral infections a few days after the sale. Ideally, to sell 2 weeks after the second vaccination. 277. May 9, 2005. 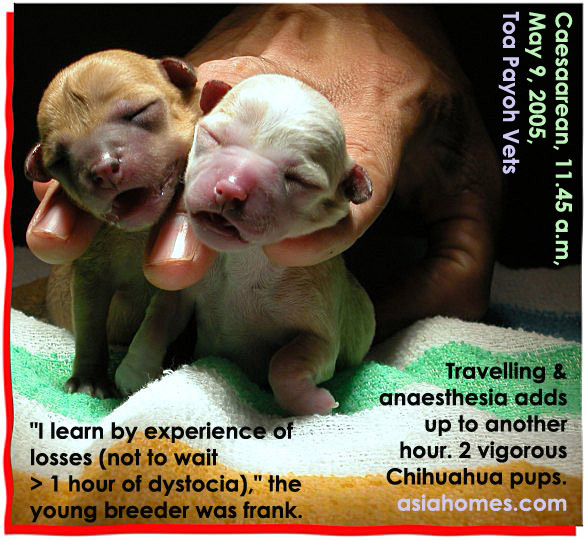 Chihuahua pups are more sensitive to Caesarean delays if there is dystocia. The breeder reminded the vet that the pups were delivered by Caesarean during the vaccination at 6 weeks at the breeding kennels. 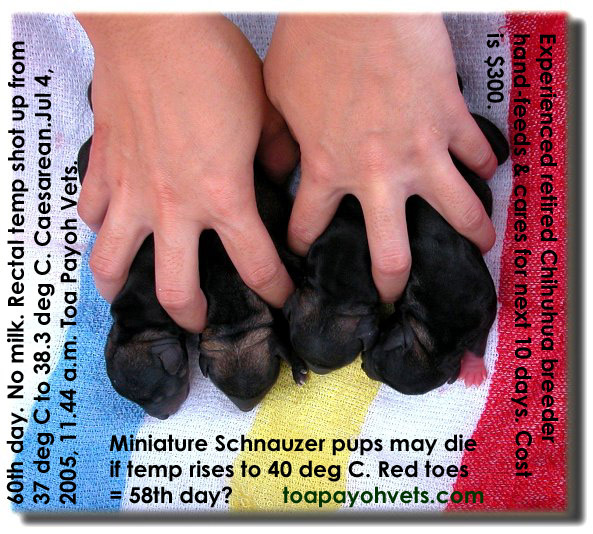 The pups were very good looking at healthy (picture 278). 276. Jun 22, 2005. Rectal temperature of 37 deg C will indicate birth due within 12 hours. But the home-breeder did not know when the temperature started dipping below 38 deg C. Waited for 1 hour. It went up to 38.1 at surgery. 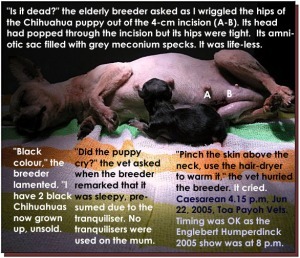 Time for Caesarean. 3 vigorous pups. 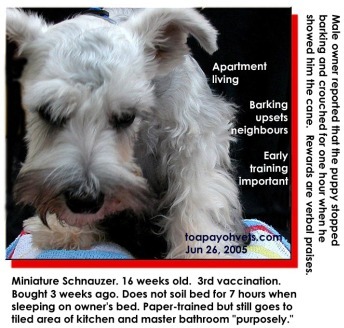 A very satisfied home breeder and family. 275. Jun 22, 2005. 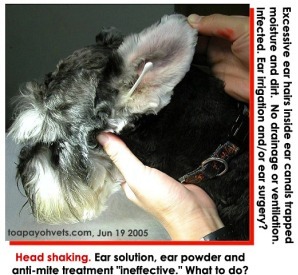 Swing pup in an arc at least 10 times to get water out from the lungs. Distressed small Pom would have died if the vet just handed the pup to the patriarch of the breeding kennels. He had loads of experience but he might not be physically able to handle the swings. 274. Jun 22, 2005. A stressed pup and mother. It is imperative that the stressed pup be actively stimulated to cry, not left alone. 273. 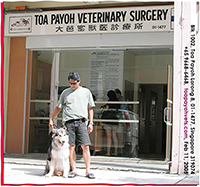 Jun 19, 2005. 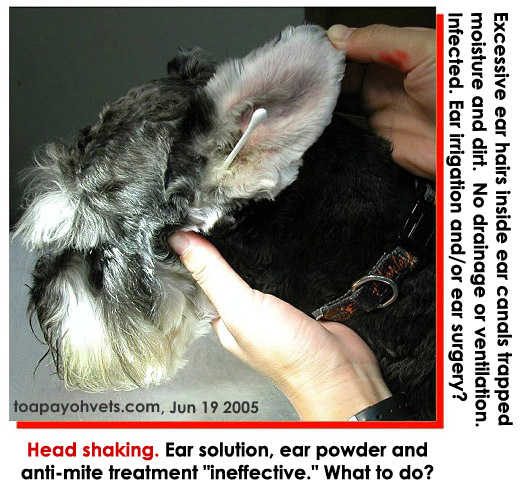 Miniature Schnauzer shook head frequently despite treatment by groomers and a vet. 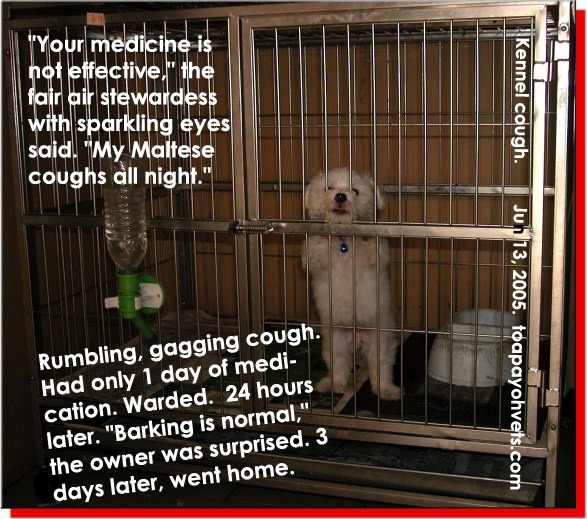 Wanted instant cure. What to do? 272. Jun 18, 2005. A young lady's dilemma. Let the old friend suffer tooth aches or risk him dying on the operating table? 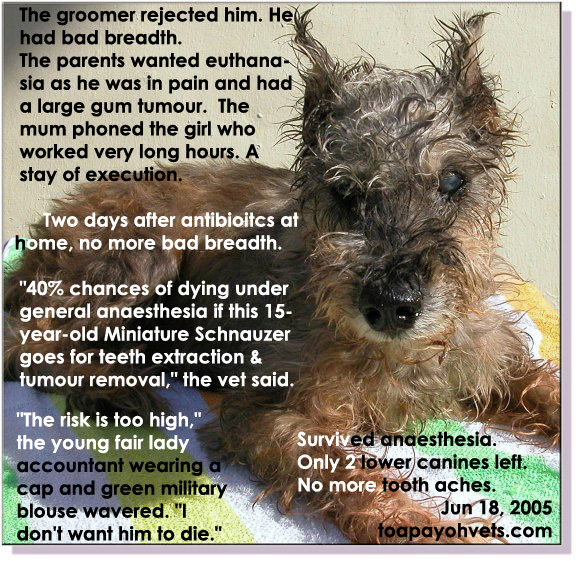 The vet had to decide for her as there were strong parental preference for euthanasia to relieve his suffering. Fortunately, the old friend lived. 271. Jun 15, 2005. Transverse positioning of large pup. 2nd & 3rd pup in separate horns. Palpate and look for the uterine body/horn junction to incise. Be patient. Not easy to locate.